This Mexican-inspired variation on the traditional baked potato (from the 28 Day Weight Loss Challenge) is EASY, packed full of veggies (quite literally) and is sure to please the whole family – especially at only $1.95 per serve! You can mix up the flavour combinations to suit your tastes too (and to use up what you have in the fridge). Don’t worry if avocados are expensive at your local shops you can just replace with some diced tomato or add some extra beans or corn to the sweet potato stuffing. Try serving with a crisp green salad, or some steamed green beans. Pierce holes in the sweet potato with a fork or skewer. Place in a microwave steamer, with a small amount of water and microwave on high for 7-10 minutes (the time will depend on microwave and size of sweet potato), or until it is lightly tender. Set the sweet potato aside to cool slightly. Once cool to touch, cut in half lengthways and scoop out the flesh so there is only a thin layer of flesh remaining lining the edges. Set aside. Heat olive oil in a frying pan over medium heat. Add onion and garlic to the pan and cook until tender. Add beans, corn and chilli powder (feel free to omit for little ones) and cook until warmed through. Add sweet potato flesh and stir through. 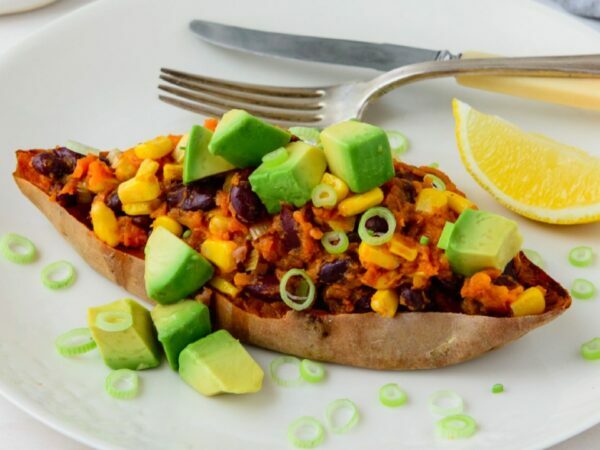 Divide bean mixture into each sweet potato skin half and serve topped with diced avocado and lemon juice. Note: if you can’t find a small sweet potato, approximately 160g, then use a larger one and serve one half per person, rather than a whole sweet potato per serve. Loved this recipe? 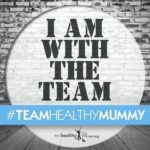 This one come directly from our 28 Day Weight Loss Challenge recipes – you can get access to over 4,000 family friendly recipes and meal plans.